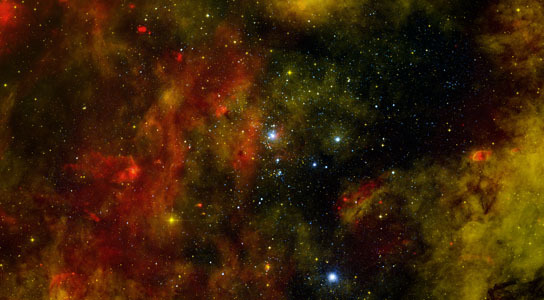 The above composite image of star cluster Cygnus OB2, which is located about 5,000 light years from Earth, contains X-rays from Chandra, infrared data from Spitzer and optical data from the Isaac Newton Telescope. The Milky Way and other galaxies in the universe harbor many young star clusters and associations that each contain hundreds to thousands of hot, massive, young stars known as O and B stars. The star cluster Cygnus OB2 contains more than 60 O-type stars and about a thousand B-type stars. At a relatively nearby distance to Earth of about 5,000 light years, Cygnus OB2 is the closest massive cluster. Deep observations with NASA’s Chandra X-ray Observatory of Cygnus OB2 have been used to detect the X-ray emission from the hot outer atmospheres, or coronas, of young stars in the cluster and to probe how these great star factories form and evolve. About 1,700 X-ray sources were detected, including about 1,450 thought to be stars in the cluster. In this image, X-rays from Chandra (blue) have been combined with infrared data from NASA’s Spitzer Space Telescope (red) and optical data from the Isaac Newton Telescope (orange). Young stars ranging in age from one million to seven million years were detected. The infrared data indicates that a very low fraction of the stars have circumstellar disks of dust and gas. Even fewer disks were found close to the massive OB stars, betraying the corrosive power of their intense radiation that leads to early destruction of their disks. Evidence is also seen that the older population of stars has lost its most massive members because of supernova explosions. Finally, a total mass of about 30,000 times the mass of the sun is derived for Cygnus OB2, similar to that of the most massive star forming regions in our Galaxy. 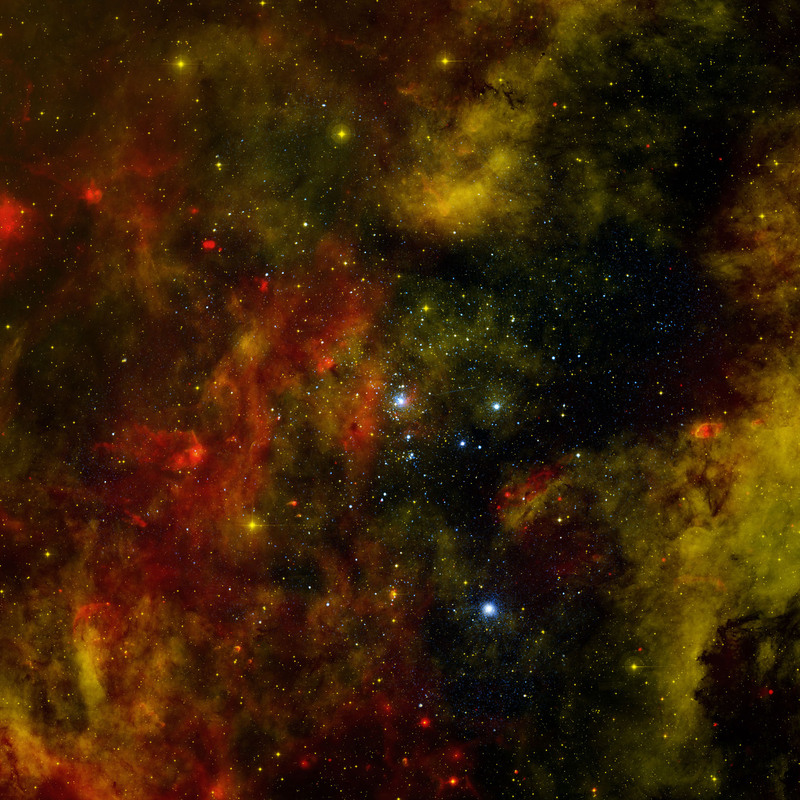 Be the first to comment on "Star Cluster Cygnus OB2"